We connect the right candidates with the right jobs. Your business is only as good as your people. Staffing Strong is a marketing, digital and creative staffing agency with 20+ years experience connecting your business with the right people. 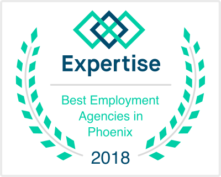 We’re proud to announce that we have been chosen as one of the Best Employment Agencies in Phoenix for 2018, ranked by Expertise. 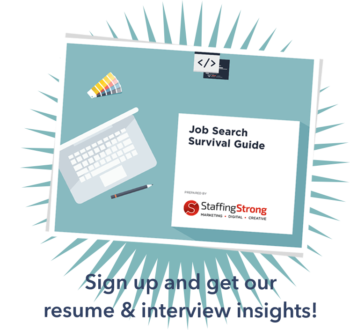 Sign up to recieve News from Staffing Strong and get our Job Search Survival Guide PDF delivered to your inbox. Staffing Strong is my go-to talent resource for my creative team. Evelyn and her staff are like working with friends. They quickly get to know you and your team so that they can place talent that will not only deliver but will be a great fit as well. I have even hired (temp) talent from them without interviewing because I felt confident in who they would send. I highly recommend Staffing Strong to any employer looking to fill any role on their creative team, from production to director and everything in between. Eve Gonzalez, Former Creative Director Philosophy/Coty. Staffing Strong has invaluable connections with the marketing and design community. When job searching, I go to them first because they understand my skill set and carefully match me with companies that I would have not known about otherwise.